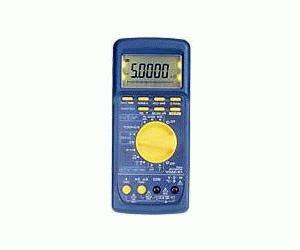 The VOAC21, which is a high-level model of the proven Iwatsu handy VOAC Series, is a handy digital multimeter with basic functions to measure DC voltage/current, AC voltage/current, and resistance, and can also measure frequency, temperature, capacitance, duty ratio, and decibels (dBm). The VOAC21 is a 4.5-digit model with a full-scale count of 50,000, permitting high-speed and high-accuracy measurements, and comes with a three-year warranty. The VOAC21 is also equipped with a backlight function, enabling operators to easily perform measurements in the dark, and has a safety-conscious design which includes a shutter that prevents current terminal mis-insertion. Furthermore, an optional communication function eases transferring data to a PC and outputting data to a printer.